The painting and carving of altarpieces was one of the most important and characteristic tasks of Italian Renaissance artists. 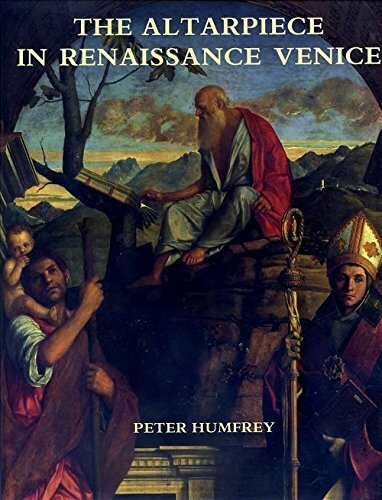 This book focuses on Venice from 1450 to 1530. Peter Humfrey, an authority on Venetian painting, explores a wide range of issues surrounding altarpieces as an art form. These include the traditions of decoration of Venetian churches, the sacred and secular functions that altarpieces were expected to perform, the market for altarpieces, and the professional world of the Venetian artist. He discusses altarpieces by Bellini, Cima, the three Vivarini, and the young Titian, as well as by numerous other painters and sculptors of the period. A central theme of the book is the relation between the altarpieces and their original physical and liturgical context. Throughout, Humfrey tries to reintegrate altarpieces with their intended settings, both for the sake of recapturing their full visual effect and as a basis for examining the ideological relationship between their subject matter and the altar table below. He also examines the complex mixture of motives, worldly as well as pious, that prompted 15th-century Venetians to spend large sums of money on commissioning altarpieces for the churches of their city. The first part of the book is thematic, dealing with the making, placement, and function of the altarpiece. The second part is a chronological discussion of specific works, focusing on the ways in which the artists met challenges posed by specific commissions. An appendix to the book gives further factual and bibliographical information about 100 major Venetian altarpieces of the period. Belatedly introduced to Venice, the Renaissance style engendered an extraordinary efflorescence of art there. Humfrey's ( The Altarpiece in the Renaissance , Cambridge Univ. Pr., 1991) lavishly illustrated, richly textured investigation is the first comprehensive consideration of the painted and carved altarpieces produced in the city between 1450 and 1530. The genre's development is incisively analyzed in terms of the religious and social requirements that impinged upon it. Other critical factors that influenced the works, such as patronage, physical settings, and the professional concerns of the artists, are also carefully elaborated. This multifaceted contextual embrace is complemented by thorough historical, formal, and iconographic discussions of individual objects. Not only will this superb synthesis provide a firm foundation for future study, it should also serve as a methodological exemplar for the discipline.